Bare root trees are best planted in the non-growing season (late fall/early winter or late winter/early spring). Balled or burlapped trees can be planted in spring, summer or fall as long as the root ball is kept moist. Be sure to remove the burlap or outer wire basket from the root ball when planting. Containerized trees are commonly those that have root balls larger than 20 inches. Stock that is free of root defects such as kinked roots or circling roots. Trees that are free from crown defects. Make sure the tree is proportioned correctly by evaluating the height-to-caliper ratio (a tree that doesn’t meet the ANSI Z60.1 standard will not be able to stand unstaked) and the caliper-to-root-ball ratio (Established by the American Association of Nurserymen. A good rule of thumb for this ratio is 1 foot of root ball for every 1 inch of trunk diameter (also called caliper). Trunk taper. Lack of taper can cause trees to fail in high winds. Crown. Half or more of the leaves should be on branches originating on the lower 2/3 of the trunk. Top-heavy crowns get more wind stressed. Branch pattern. Look for branches angled between 45 and 90 degrees. A tree with main leader branches cut back should not be purchased. Vigor. Look for large, dark green leaves and smooth, bright bark. Roots should be white and fleshy; roots that are dry and dark may have been in the container too long. Injuries. Plants with injured bark or with discolored trunks due to sunburn are less healthy. 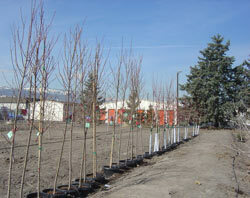 Think of planting a tree in the ground as transplanting a living plant. Follow practices that reduce transplant shock.